Me and my fiancee are getting married at the swan and dolphin next June. We're lucky enough to be having about 20 people come with us from Scotland but the one thing we are really struggling to decide on in where to have a reception with food. We can't decide if sit down or buffet is the way to go? Should we go in park or not? Just looking to see if I might find some inspiration for us on here, does anyone have any recommendations for a small group? You may want to check out the disney wedding podcast, either on iTunes or through its website. Carrie has interviewed several swan and dolphin, as well as escape wedding couples who have used various venues throughout property. Her book, the pass porter guide to disney weddings and honeymoon also has a table with group dining and private room information. I've read good things about Garden Grove, Il Mulino, and Bluezoo at the S&D, as well as 1900 Park Fare, Yatchsman Steakhouse and Flying Fish. Keep on mind that depending on what you'll be wearing for your ceremony, you may or may not be able to wear it into the parks. Hi thanks! We were warned about the dress restrictions so my fiancee has already planned an evening outfit as backup so we didn't have to limit ourselves. We do listen to the podcast so have a few idea's but were just wanting to reach out see if any one has any personal recommendations to share. 1900 Park Fare would be my number one choice. As mentioned above, Passporters is a great source to check out! If you're getting married at Swan and Dolphin, what time will the wedding be? We did our wedding at Sea Breeze Point on the boardwalk (2:30) and did a dinner at Yachtsman Steakhouse (5:00pm reservation). We also had a Dessert Party. We wanted to keep our dinner in the Boardwalk area so our guests wouldn't have to travel much. If I had to do it all over again - I would have done appetizers at Big River Grille and done slider burgers and ice cream at the dessert party. 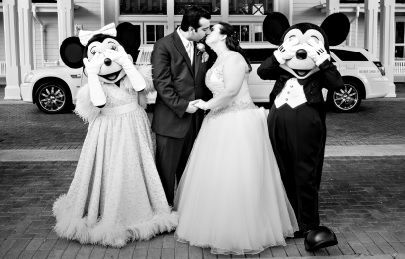 You can still have a dessert party, but it would go through Disney Catered Events and you'd have to change out of wedding attire (as you already know). Any of the resort restaurants should allow wedding attire. Hi thanks all for the responses, were getting married at 2pm so it was an evening meal were looking for. We didn't realize you could get more out of the desert party than just "deserts" so will have to have a better look at that, just to add more confusion to the mix lol! If you choose to have actual food vs. deserts, is that costlier? Or do you choose based on menus? If we do Swan and Dolphin instead of an Escape wedding I think we'll still go for a Boardwalk venue for a meal. It would mean ruling out a buffet as I wouldn't be able to wear my dress so we'd probably go for Yachtsman Steakhouse but the Yacht/Beach Club and Boardwalk area is just so pretty and I'd like to stay close to Disney rather than spend the majority of the day at the Swan/Dolphin. We are getting married at the swan but hoping for a dinner reservation at Christmas. I can wear my dress there right?